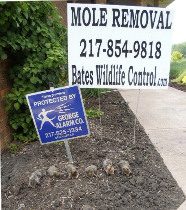 Mole Removal, Mole Trapper, / Springfield, IL. Moles can really make the yard a mess. The raised tunnels and mole mounds can kill grass where they go. Moles are insectavores so they are looking for worms, grubs and insects to eat. It takes a lot of energy to find food so they eat several times a day. Moles have just one litter usually around April. Mole activity is at it's highest in the spring and fall when the ground has a lot of moisture. I have heard lots of home remedies on how to get rid of moles. Juicey Fruit gum, castor beans, gummy worms, moth balls, and electronic devices just to name a few. None of these will work. I set traps that catch the moles under the surface and can only be activated from underneath the trap so kids and pets are safe. Per request, I can show you any or all casualities. A dead mole can not reproduce! We specialize in mole removal. We have several different mole trapping packages designed for your problem. Our most popular package is one entire week of trapping. We come set more traps than there are moles to quickly remove as many as possible. Traps are checked two or three times during the week to be reset and/or moved, if necessary, in order to maximize elimination. All traps are marked with an orange flag. A single mole can do a lot of damage. People usually think they have dozens of moles, but actually do not. The average yard only has one to three moles. The most effective time to trap them is when you have seen fresh activity, so don't wait until they get out of hand. Prices depend on travel distance and the size of yard. All traps are marked with a orange flag.